One recipe to success as a job board is testing various online sources to drive qualified candidates to your site to boost job applications. As Facebook promotions has become popular amongst advertisers, how does this avenue measure for job boards? We recently completed a case study with a client job board on testing the effectiveness of advertising on Facebook and Job Aggregators. Let’s see who won? Over a 60 day period, we measured two important stats on the job board of how many users registered and applied on the site. 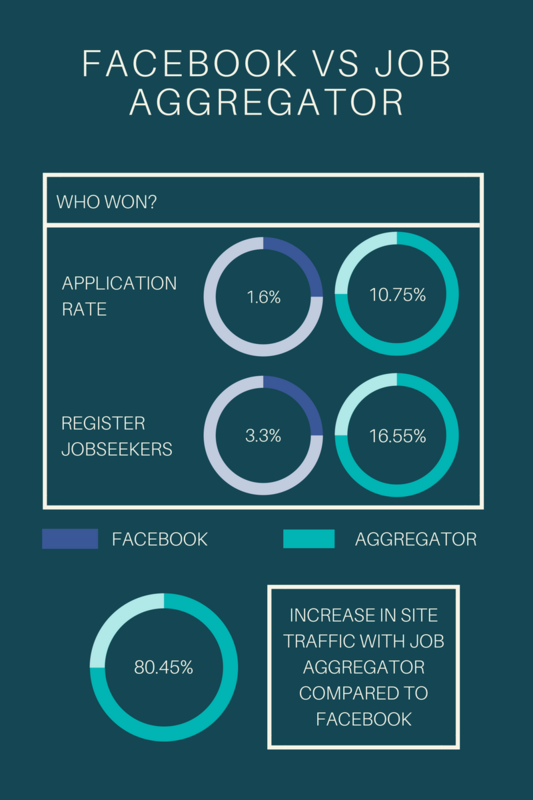 We measured the effectiveness of Facebook vs one of the major job aggregators in the market. And, the job aggregator clearly won the battle! Job aggregators have long been viewed as a necessary beast in the market to help provide traffic to your job board. And, as many job boards have experienced with one particular company (We won’t mention names, but pretty sure you can figure out who we are talking about) can cripple your business at the flick of a switch. Even though the lack of effectiveness by Facebook for driving applications and registered candidates, we would continue to recommend clients on using Facebook to boost your Facebook company page for likes and follows. As an example, our client used Facebook promotions to advertise to jobseekers to register on the site and the cost per click was $0.17, in which, is traditionally much lower than aggregators. It is important to use a vast number of resources to attract traffic to your site as becoming solely dependent on one source may be a recipe for disaster. We hope this article provides you with some helpful insight into running an effective niche job board. If you are interested to learn more about the JOBartO technology, click here to schedule a demo with one of our team members. This is a best informative blog and I am glad that I have come across this blog post about running a job board effectively with the job aggregator. Also, there is some information about the job feeds that I was confused about. Now, after reading the blog I understood everything about this concept.